SOE’s Dr. Grace Abou Jaoude represents LAU in the Order of Engineers and Architects’ conference on Earthquakes in Lebanon. 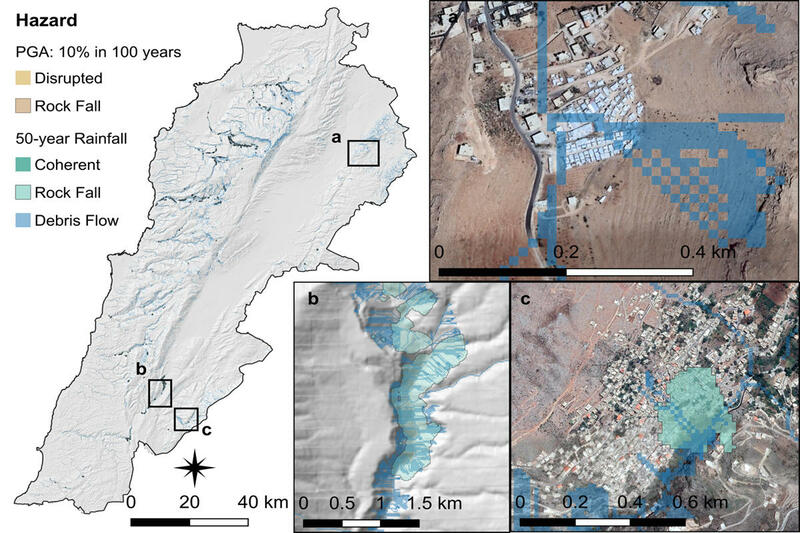 (a) A populated area in Arsal at risk from debris flow in all return-period precipitation events (50-year shown). (b) Precipitation induced rockfall and debris flow from the high cliffs of the Litani River valley near Yohmor. Coseismic rockfall (not shown) covers similar extent. (c) Rockfall hazard to urban populations in Chebaa. Base images from Google EarthTM. Earthquakes are feared for their virtually undetectable, unpredictable, and destructive nature, and in Lebanon, the damage they can cause is often compounded by the country’s natural terrain and weak infrastructure. Consequently, Lebanon’s Order of Engineers and Architects (OEA) hosted their second-annual conference, called Earthquakes in Lebanon and the World in the Past Decade: Between History and Fact. Lebanon is situated on the Dead Sea Transform fault system, which is an active seismic zone that extends from southeastern Turkey to the northern part of the Red Sea. Though it has experienced a number of earthquakes in the last 200 years, very little has been done to ensure that infrastructure, buildings and society at large are ready to cope in the event of another. Dr. Gebran Karam, associate professor at LAU’s School of Engineering (SOE), noted that provisions for seismic conditions must be made. In 2012, the Lebanese government instituted the Public Safety Decree 7964, which mandated (among other requirements) that a seismic analysis be completed for any new construction project above a specified size. “These first steps taken by the government, in conjunction with their partnership with the OEA, are positive measures for protecting our society from the risks of damage caused by earthquakes,” says Dr. Karam. The OEA recognizes that earthquakes represent a new area of research in Lebanon – one that is slowly evolving but is critical to the safety and wellbeing of the country’s residents. For this reason, they have called on universities and industry professionals to partner in conducting research and implementing new codes that reflect the possibility of a seismic event recurring in Lebanon. Representing LAU at the conference, SOE Associate Professor Dr. Grace Abou Jaoude outlined her work on Landslide Hazard and Risk Assessment in Lebanon. There is a probability of landslides occurring as a result of earthquakes or major rain events in Lebanon, and Dr. Abou Jaoude’s research is devoted to quantifying those risks. As data of this nature has never been collected, her work is of particular interest to engineers, architects and city planners. By using geotechnical modeling, as opposed to the statistical studies similar to what has been done in the past, Dr. Abou Jaoude has been able to identify and assess slip rates of the areas in Lebanon that are at the greatest risk of damage from landslides. “Although high magnitude earthquakes are relatively rare occurrences in Lebanon, collecting data allows us to quantify the risks of landslides to the local population, and take any action necessary to mitigate those risks,” she says. Earthquakes are not the only event that can cause landslides – significant rainfall can be even more detrimental. However, since records of destruction and costs from major precipitations are easily quantifiable, Dr. Abou Jaoude has focused her research on what the current data lacks: the impact of earthquakes on the local community. The results of Dr. Abou Jaoude’s research shed light on the urban communities that are at the highest risk of landslides – both seismic and precipitation-induced. The future challenge lies in making sure Lebanon’s infrastructure and built environment are adequately prepared to withstand those hazards.